It is not an easy task to list the top waterfalls in England as it is, of course, subject to your own personal taste and experience. However, I’m sure you’ll agree that some of these are up there amongst your favourites. Most of the falls featured here are situated in the Northern parts of England, with the beautiful Lake District featuring regularly. Most of them are called Force, which is an adaptation of old English, meaning falls. This part of England is stunningly beautiful with its picturesque mountains and, it seems, a lake around every corner. Stock Ghyll Force is a stone’s throw from the centre of the town of Ambleside. This fall is 70 feet high and may be viewed from the safety of a viewpoint. Stock Ghyll is a tributary of the river Rothay and drops through many small falls to the point where the sheer force of the water once used to drive 12 watermills. These mills produced paper, processed fabrics, bobbins and ground corn, during the industrial boom. One of the mills is the Old Corn Mill, an occupied site since 1335 AD. Colwith Force is an awesome waterfall. The water drops in many stages down a total height of 40 feet, and the final double spout is the most spectacular feature. Set in beautiful woodland it is absolutely enchanting. 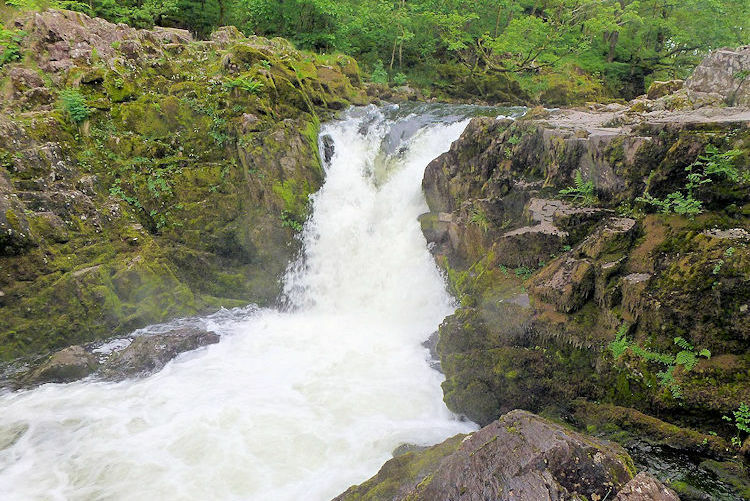 A short walk away, Skelwith Force is a small waterful, but hugely powerful as the river is reduced to about one meter, and tumbles over a two-metre rock ledge. Mentioned in three of Wordsworth’s poems and the most famous falls in the lake district, the 70 foot Aira Force is close to the picturesque Ullswater in the heart of the region. After an amble around the falls, William Wordsworth wrote “I wandered lonely as a cloud”. Just before entering Ullswater, the river makes the 66-foot drop down a rocky, steep-sided ravine known as Aira Force. The water then falls 72 feet to a rocky pool, from where it continues through a low-lying valley to the lake. A small bridge spans the falls, allowing visitors a clear view to the bottom. Aysgarth Falls, Wensleydale , Yorkshire Dales National Park, Richmondshire, North Yorkshire Aysgarth Falls is a series of three waterfalls which are referred to as Upper, Middle, and Lower. These falls do not dramatically drop over a cliff but are more like cascades, particularly good for photography enthusiasts. It is around a 40-minute excursion to view all three falls. These falls were the filming location for the movie Robin Hood – Prince of Thieves. East Gill flows into the River Swale around 300 yards from the village of Keld, Swaledale in the Yorkshire Dales. The Gill begins at Rogan’s Seat and flows in a southerly direction, passing by East Stonesdale. At the point where the Pennine Way and the Coast to Coast footpaths meet, the Gill plunges over East Gill Force in a series of two falls. The first is a 15-foot waterfall that can be enjoyed from a cannily placed seat, the second is where the East Gill flows into the River Swale and is best seen from the other side of the river. Gaping Gill (or Ghyll) is about as raw an experience as you can get, as it doesn’t deviate from Mother Nature, apart from the mechanical access so that non-cavers can visit. One is lowered by a winch into the cave, a journey of about one minute in length. Then you can feel the spray of three waterfalls converging into the Gaping Gill. From there you are taken to a spacious and slightly drier part of the cave for an amazing view of Gaping Gill, which holds the English record for the highest unbroken waterfall plus the largest underground chamber with natural access to the surface. Located on the River Tees, High Force stands 71 feet tall. The Pennine Way National Trail bypasses the falls on the 268-mile treck across Northern England. High Force is one of the most spectacular waterfalls in England in the heart of the Durham Dales. The river begins as a trickle at the top of the North Pennines, then to the top of dolerite rock at Forest-in-Teesdale. From there the River Tees gradually but steadily grows and gathers speed, and suddenly and spectacularly drops 69 feet into the plunge pool below. A scenic and easy woodland walk leads you to view this spectacular sight at the base of the falls. High Force is surrounded by the rolling countryside of Upper Teesdale and is situated in the North Pennines Area of Outstanding Natural Beauty. A variety of animal and plant life can be seen at High Force throughout the seasons. Nestling in the beautiful park in the South West of England, this is a low waterfall ,meandering through a series of boulders. While not spectacular or photogenic, it is a more peaceful experience for those out on a gentle wander through nature. It is much better viewed after heavy rainfall. There are many waterfalls not featured here throughout England. Plan your trip to include as many as you can. Previous StoryHow to choose a river cruise in England?